There are two main rules proposed by G. R. Kirchoff. Kirchoff's first rule, also known as the junction rule, states that at any junction point, the sum of all currents entering the junction must equal the sum of all currents leaving the junction. 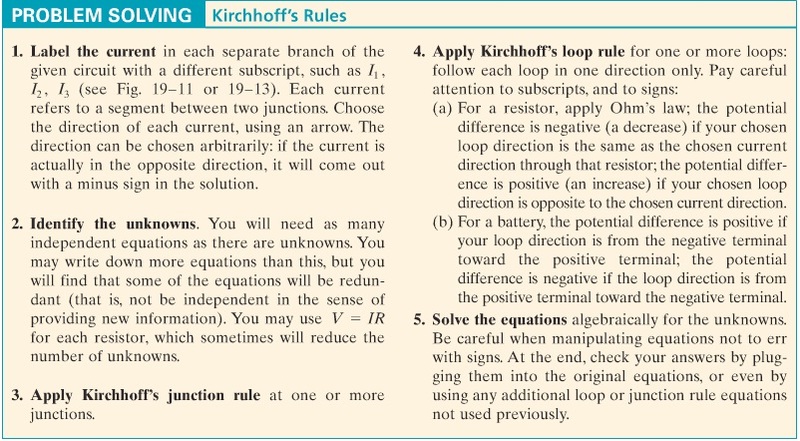 Kirchoff's second rule, also known as the loop rule, states that the sum of the changes in potential around any closed path of a circuit must be zero. Generally, this means that the voltage decreases gradually when passing through resistors and voltage increases when passing through a battery. However, the direction of the current may sometimes be reversed. If so, voltage "increases" when going through resistors and "decreases" when going through a battery. If you still have trouble understanding this topic, do not forget to do a lot of practice questions! A general guide on how to solve these types of questions are given above. Since the AP Physics B exam hasn't covered this topic specifically for the past ten years, it's okay if you don't completely get this.